Local people standing on the wreckage of a small plane that crashed in February 1998 into the riverbank at Nasir, killing the Vice President of Sudan, Lieut. Gen. al-Zubeir Mohammed Saleh, among others. Morton, Chris. 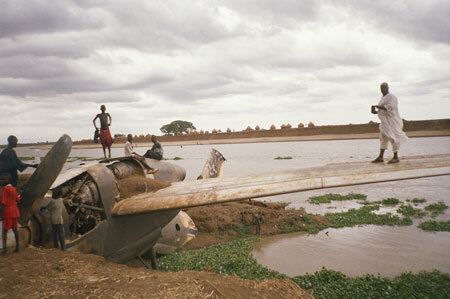 "Wreckage of plane" Southern Sudan Project (in development). 03 Jan. 2006. Pitt Rivers Museum. <http://southernsudan.prm.ox.ac.uk/details/2007.137.28/>.